The US manufacturing sector has been weakening along with the global economy. On Monday the Markit final US March manufacturing PMI came in at 52.4, the lowest since June 2017. However the regional Chicago ISM Manufacturing PMI rebounded to 55.3. "The latest PMI signalled a moderate improvement in operating conditions across the U.S manufacturing sector in March, dropping to its lowest level since mid-2017 amid softer increases in output and new orders. Nonetheless, the rate of job creation remained solid despite broadly unchanged levels of outstanding business. Meanwhile, cost pressures eased further as the rate of input price inflation softened for the fifth successive month. Output charges also rose at a slower pace." The moderate improvement in the health of the manufacturing sector was the weakest since June 2017 and notably softer than the trend seen for 2018. Moreover, the first quarter average of 2019 was the lowest since the third quarter of 2017. "A futher deterioraton in the manufacturing PMI suggests the factory sector is acting as an increasing drag on the US economy. The March survey is consistent with production falling at a quarterly rate of 0.6% according to historical comparisons with official data. “Encouragingly, companies report that at least some of the slowdown is due to capacity constraints, notably in terms of skill shortages. One-in-three companies reporting a drop in headcounts cited an inability to fill vacancies. Those looking for positive signals will therefore note that hiring remained encouragingly solid during the month and expectations of future output perked up, albeit still running below levels seen this time last year. 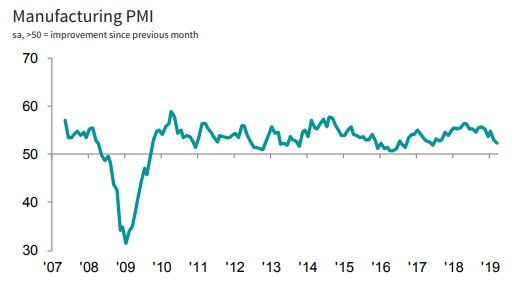 The ISM Manufacturing PMI rose to 55.3 in March of 2019 from 54.2 in February which was the lowest reading since November of 2016. Faster increases were seen for new orders, production and employment. Business Confidence in the United States is reported by Institute for Supply Management.